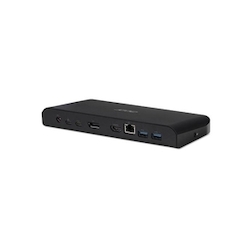 USB Type-C Dock Interfaces: Two USB Type-C(one connects to notebook)three USB 3. 1,DisplayPorT,HDMI,RJ-45 LAN, headphone/speaker, microphone. Includes 135W AC ad apter, power cord, Kensington lock slot.